LOS ANGELES (Reuters) - A dead oarfish, a mysterious and serpent-like creature that swims deep below the ocean's surface, has washed up on a Southern California island and a university biologist will study the remains, officials said on Wednesday. Amy Catalano said she and a co-worker at the Catalina Island Conservancy were conducting a bird survey on Monday and standing on a bluff when they spotted the long body of the creature on the island's shore below. "It was amazing, it felt like a movie prop, it looked make-believe almost," she said. Oarfish are of interest to scientists because they live in a largely unknown ecosystem of the oceanic mesopelagic zone, the part of the ocean that is about 660 to 3,280 feet (200 to 1,000 meters) below the surface. This oarfish measured about 13.5 feet (4.1 meters) long, said Catalano, a conservation coordinator who said she believes the fish had washed ashore only minutes before the discovery. The serpent-like creatures can grow to be more than 20 feet (6 meters) long, according to the National Oceanic and Atmospheric Administration. The specimen's head, guts, reproductive tract and other parts were sent to California State University, Fullerton, where Assistant Professor of Biological Science Misty Paig-Tran and her students will study the remains, a university spokesman said in an email. Seagulls were feasting on the rest of the carcass left on the shore, Catalano said. 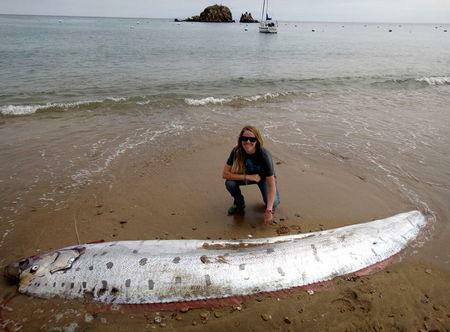 In 2013, scientists and wildlife aficionados reacted with interest when two oarfish washed ashore in Southern California, with one found in Oceanside and the other on Catalina Island.